The Obama administration is weighing the opening of a new front in the air war against the Islamic State in Syria, part of an offensive to push back militants along the western portion of Syria’s border with Turkey and create a relatively safe zone for U.S.-backed Syrian rebel forces to move in. Under the plan, U.S. aircraft flying from Turkey’s Incirlik air base would target positions the militants currently hold along the border north of Aleppo, eastward toward the besieged town of Kobane. Turkish special forces would move into the area to assist targeting and help Syrian opposition fighters consolidate their hold on the territory. President Obama, who has not yet approved the proposal, was briefed on its parameters at a meeting with his senior national security advisers last Wednesday. The plan, which was developed over the past several weeks during extensive meetings between U.S. and Turkish diplomatic and military officials, also was a subject of discussion between Vice President Biden and Turkey’s top political leaders during Biden’s visit to Istanbul 10 days ago. 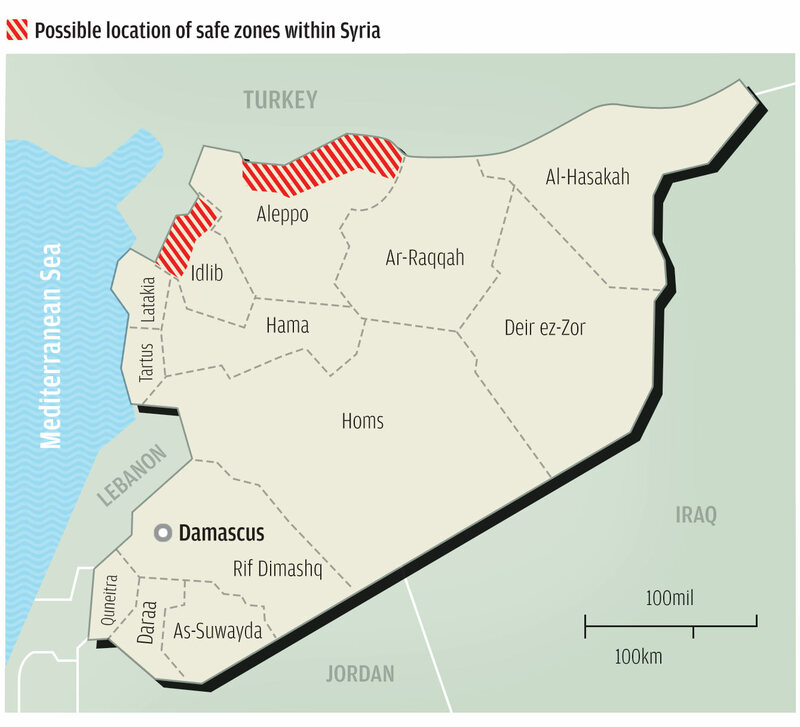 The proposal at least partly addresses Turkey’s long-standing desire for a protected buffer zone inside Syria along the entire 511-mile border, while providing the faltering rebel fighters with a much-needed boost. In exchange, U.S. access to Incirlik for use of manned warplanes and armed drones throughout Syria would add as many as six hours to the amount of time that individual strike aircraft could spend “on station,” locating and reaching targets. Aircraft currently striking Islamic State positions in northern and eastern Syria fly from bases in the Persian Gulf, a distance of about 1,000 miles. “That access is huge,” a U.S. official said. At the same time, having Turkish special forces on the ground inside Syria would not only “breathe life into the Free Syrian Army,” but also provide “more capable folks to help with targeting” for airstrikes. Right now, the official said, targets are pinpointed with short-term aerial surveillance and friendly Syrian “dudes with cellphones” on the ground. The official was one of several who described the plan on the condition of anonymity because they were not authorized to discuss it. A spokesman for the National Security Council declined to comment on the proposal. If implemented, the plan would require significantly more resources than are now devoted to the fight against the Islamic State in Syria, including more planes and more money. Turkey and retired Gen. John Allen, the administration’s chief envoy to the U.S.-led coalition against the Islamic State, have assessed that the Free Syrian Army, despite its disorganized and depleted state, can marshal sufficient trained forces to gradually move eastward into the zone. 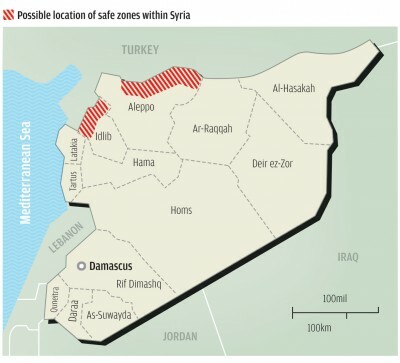 Although officials said the proposal is not intended to establish a traditional no-fly zone requiring constant patrols against other aircraft entering the area — potentially up to 100 miles long and 20 miles deep inside Syria — its proponents recognize the potential for a “slippery slope” into a far more major operation. Part of the administration’s risk assessment is whether Syrian President Bashar al-Assad will continue to allow overflights of his territory without activating Syrian air defenses, as he has with American aircraft now striking the Islamic State in areas largely to the east of the proposed new front. “Up to now, it’s been uncoordinated deconfliction,” the U.S. official said. “It’s not as though Centcom calls up the Syrians every morning and says, ‘Don’t go where we’re going.’ ” The U.S. Central Command is in charge of American military operations in Syria and Iraq. Administration officials watched with concern last week as Syrian government aircraft bombed the north-central Syrian city of Raqqah, the center of Islamic State operations in the country. U.S. strikes have been targeting the militants in and around the city since September. U.S. attacks in the proposed new corridor north of Aleppo would bring American aircraft into far more consistent contact with Syrian aircraft, which regularly strike that city. Top Pentagon officials have said that any attempt by Assad to interfere with U.S. aircraft would bring a broad attack on Syria’s air force and air defense system. Many officials, particularly in the White House and within the military, remain distrustful of Turkey’s desire to draw the United States into a direct confrontation with Assad. After months of resisting joining the U.S.-led coalition against the Islamic State, Turkey this fall agreed to allow the establishment of a training base for Free Syrian Army fighters inside its territory. Turkey is training about 1,300 Iraqi Kurdish fighters, called the peshmerga, to fight against the Islamic State. The Turkish parliament has given President Recep Tayyip Erdogan permission to allow Turkish forces to enter Syria, but he has not used that authority. Although Turkey allows unarmed U.S. surveillance aircraft to fly from Incirlik, it has refused until now to allow the facility to be used as a base for strike aircraft flying missions inside Syria. Officials described the plan, some elements of which were reported online Monday by the Wall Street Journal and Bloomberg News, as still in the planning stages. “There is nothing imminent, and a lot of details still to come,” the U.S. official said. If america thinks the middle east is incapable then it shouldn’t be complaining and weary of a confrontation with ASSad. Nor expect the middle east to follow its command when U.S has been financing the wars which has lead us here. If you want to help then those in authority will tell U.S what to do we are not like the shiits who follow like sheep and have no dignity or balls.